It’s March (totally late posting this – ugh. It is now early May – how does this happen?) which means I’m thinking about the end of casserole season (true) at least for here in the North West Florida Gulf Coast. It’s already starting to get in the 70’s during the day (now in the 80’s). 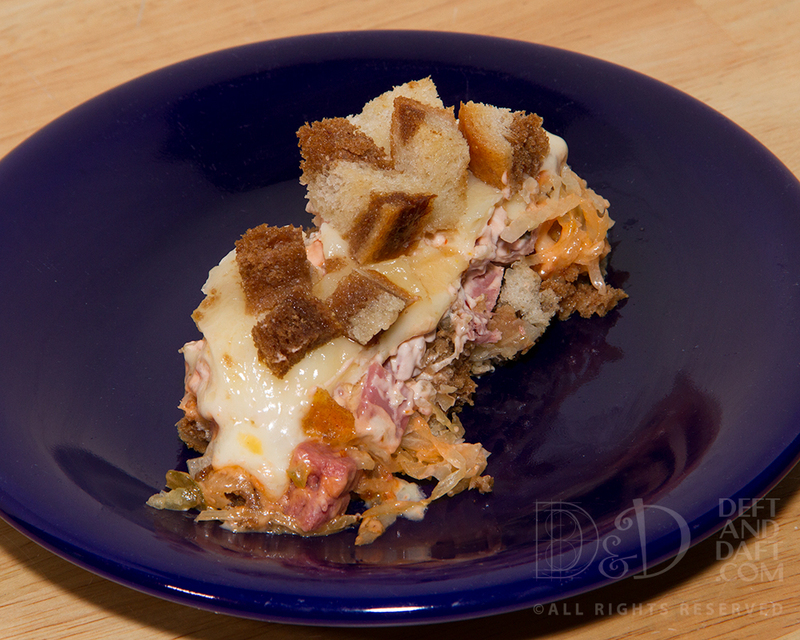 One of my favorite casseroles is a Reuben casserole – all the flavor of a Reuben, but the ease of a casserole and, better still, leftovers! Excellent. I started making this years ago, and I’ve modified it and scaled it down for the two of us (the Boy is not a fan – I think I didn’t raise him right. He also does not like collards, or boiled peanuts – yes, I’m a disappointment as a southern cook – or mom). I’ve taken some tricks from Cook’s Country’s recipe from their “Best Reuben Sandwich” especially their version of the traditionally-used Thousand Island dressing. I mean why buy bottled stuff (ugh) when you can make your own version with things you have on hand – mayo, chili sauce or cocktail sauce, and relish. This is a pretty quick and easy meal and this time of year (March) you can bet corned beef and Guinness are on sale. The Guinness is for drinking (mostly! ), Brownies, and Chocolate Cake – in that order. Preheat oven to 350 degrees. Spray 8 x 8″ ( 9 x 9″ whatever you have) with non-stick spray. In a bowl, mix together mayonnaise, chili sauce, relish, sour cream, and onion. Arrange rye cubes in the bottom of the pan reserving 1/4 cup of cubes for topping. Layer on sauerkraut and corned beef. Spread with dressing mixture over the corned beef. Sprinkle with cheese, top with remaining rye, and drizzle with butter. Cover with foil, and bake 15 minutes. Uncover and bake 10 more minutes until bubbly and lightly brown.